McManemin Companies | Kwik Stix All the Fun without the Mess! Kwik Stix All the Fun Without the Mess! 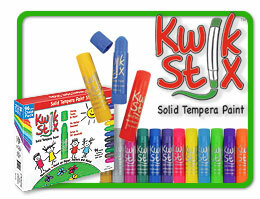 Craft time with the kids couldn’t be more fun or easier than with Kwik Stix by the Pencil Grip, Inc.! If you are looking for something to entertain your kids but dread the mess and clean up of traditional paints try Kwik Stix. Creative and available in loads of colors, Kwik Stix is sure to keep kids busy and happy and eliminate the spills, spatters and mess! Rainy day fun or a break from the sun and clean up in a snap! Enjoy the video below for more about Kwik Stix!